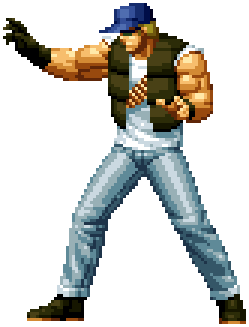 Clark Still (クラーク・スティル) is part of the Ikari Warriors mercenary agency. He is currently under the orders of Commander Heidern and Lieutenant Ralf Jones. His first meeting with Commander Heidern occurred in a secret operation in the Amazon jungle (in Brazil, together with Ralf Jones). Their helicopter crashed, and they had to venture alone in the jungle. When they were about to give up hope, a helicopter suddenly appeared above them. Heidern got down from the helicopter, and knowing of the missions of the two mercenaries, he offered to recruit them in the next King of Fighters tournament in 1994. The two soldiers accepted, soon becoming acquainted with Leona Heidern after the next tournament. After The King of Fighters '97 , Clark and his friends focused more on other operations. However, Commander Heidern soon assigned the Ikari Warriors to investigate the force behind the tournament this time around.